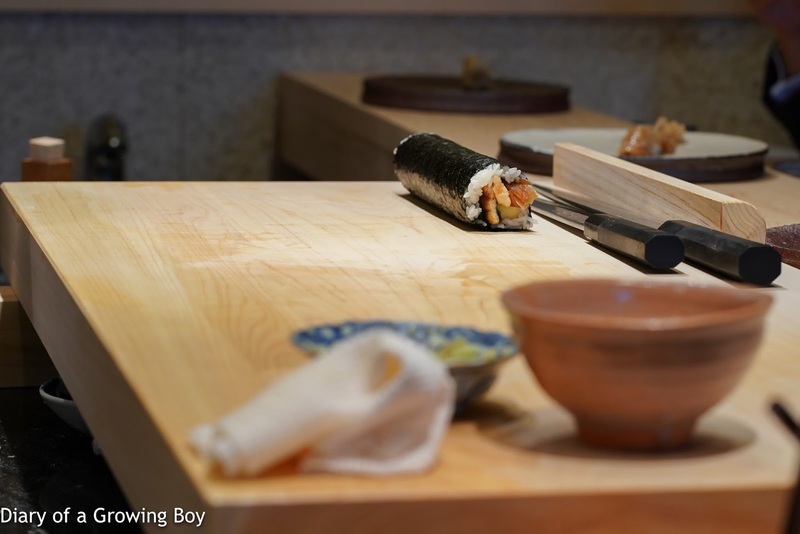 I sat in the exact same seat as I did last week, and today the restaurant provided me with an extra napkin so I could rest my camera on the beautiful counter - made from Japanese cypress (檜) from a tree that had been 400 years old - instead of nestling it on my lap as I did last week. Before we started, I was asked whether I wanted to substitute other neta (ねた) in place of bluefin tuna. Yes, that would be nice... but I didn't want to cause too much trouble for Koba-san, so I left it up to him. Japanese horsehair crab (毛蟹) - this was delicious. 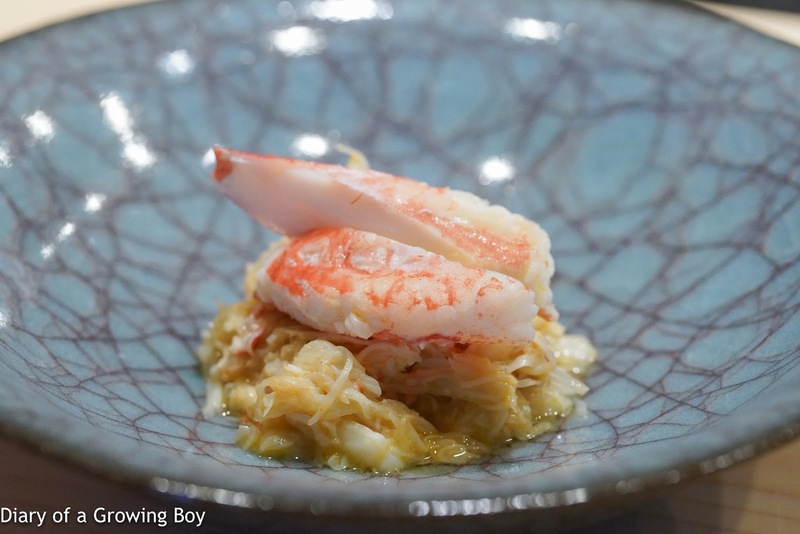 The crab meat seemed to have been cooked with a little sake, along with some tomalley (蟹味噌). Loved the fragrance while it was still warm. The only problem was that I found 2 pieces of shell with the crab meat... and one of them was rather large. 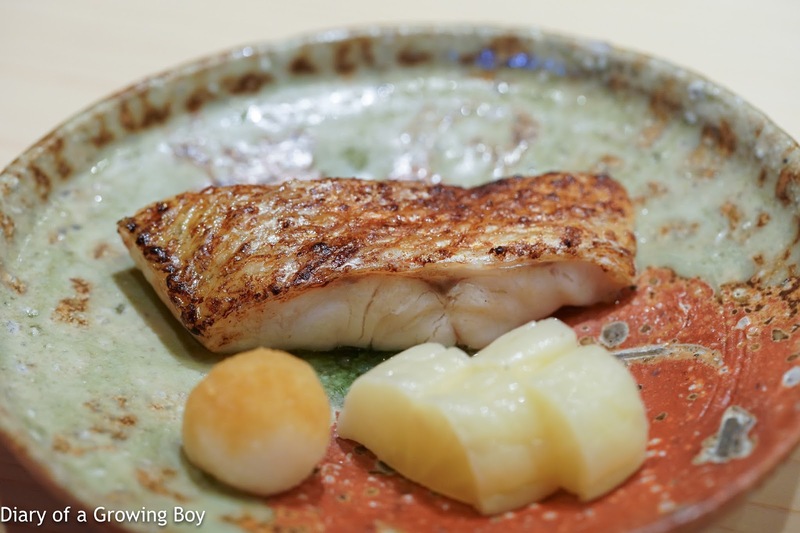 Rosy seabass (喉黒) - is it possible that this piece in front of me today was even more fatty than the piece I had last week? Very, very juicy and tender. Sooo delicious. Baby sea bream (春子鯛) - yes, the first piece still brings with it a jolt of acidity - both from the vinegar in the shari (しゃり) as well as the neta (ねた). 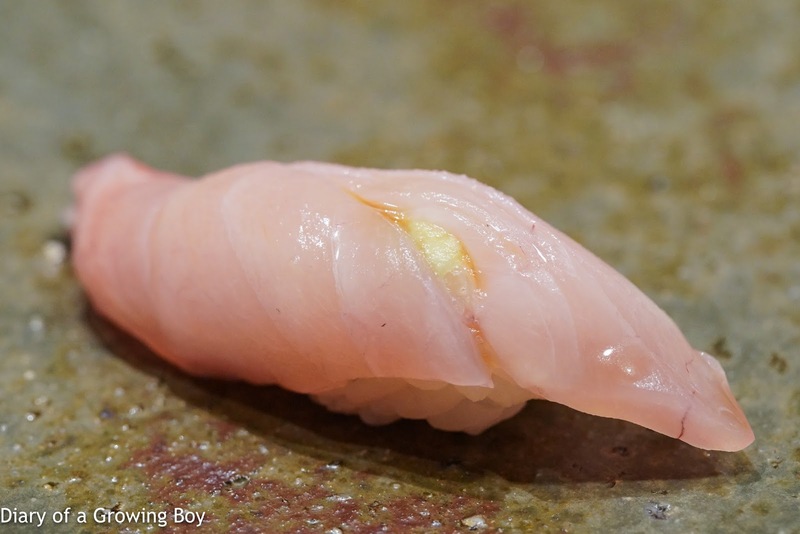 Besides the couple of drops of juice from sudachi (酢橘), I suspect that the fish itself was marinated in vinegar the same way sushi chefs treat gizzard shad (小鰭). Splendid alfonsino (金目鯛) - surprised to find that Mrs. Birdiegolf was not a fan. I think her piece had some sinews which made it more chewy. 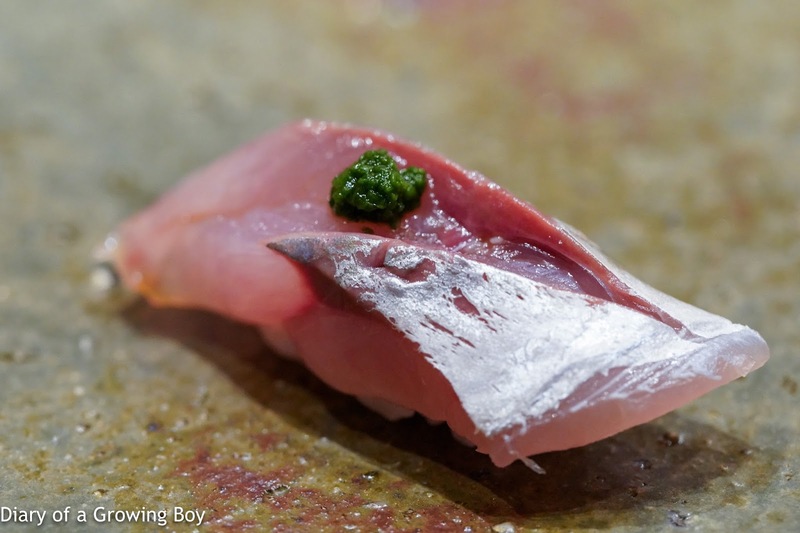 Horse mackerel (鯵) - this was a pretty thick cut, and even with the aging this was a little more crunchy than I had expected. This was also the first piece where I actually started to taste the wasabi. 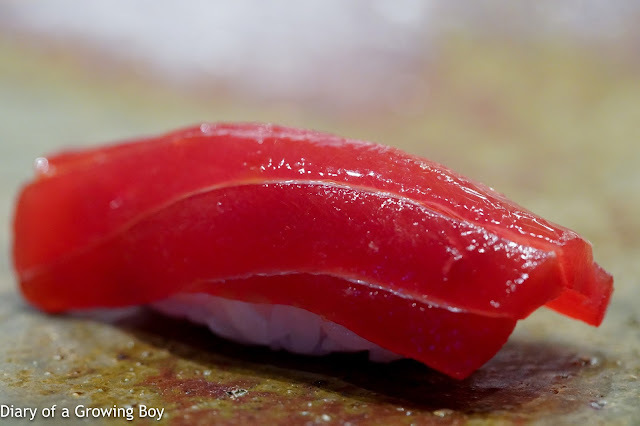 Lean tuna (あかみ) - so I still got one piece of bluefin tuna, but it was fine. 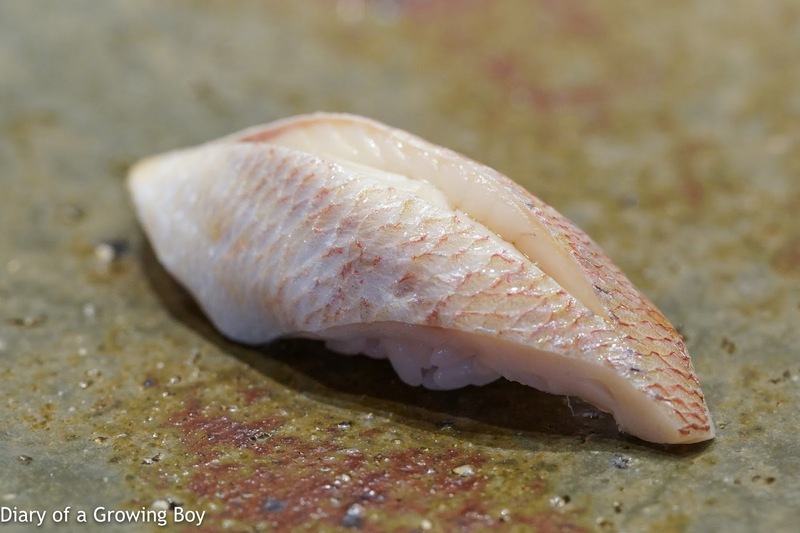 This one came from the waters around Kyoto, and was very tender. 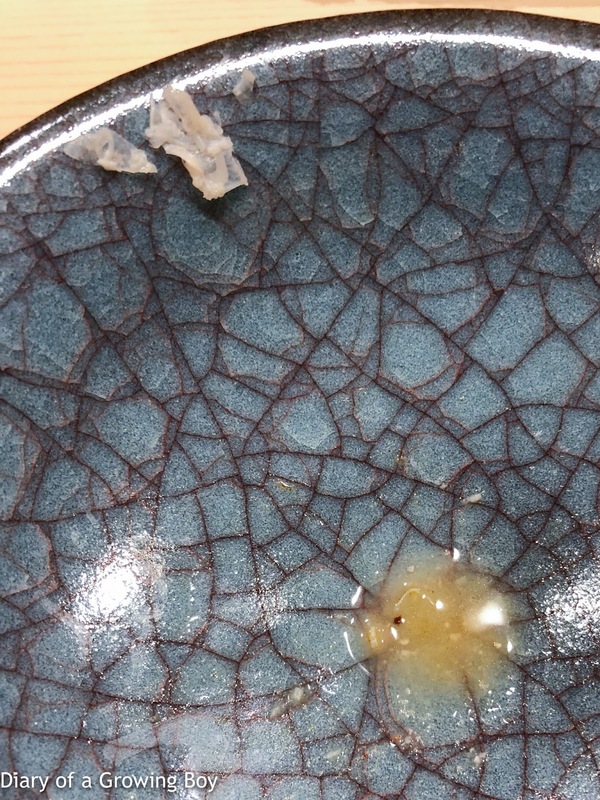 The wasabi in this piece was a little stronger. 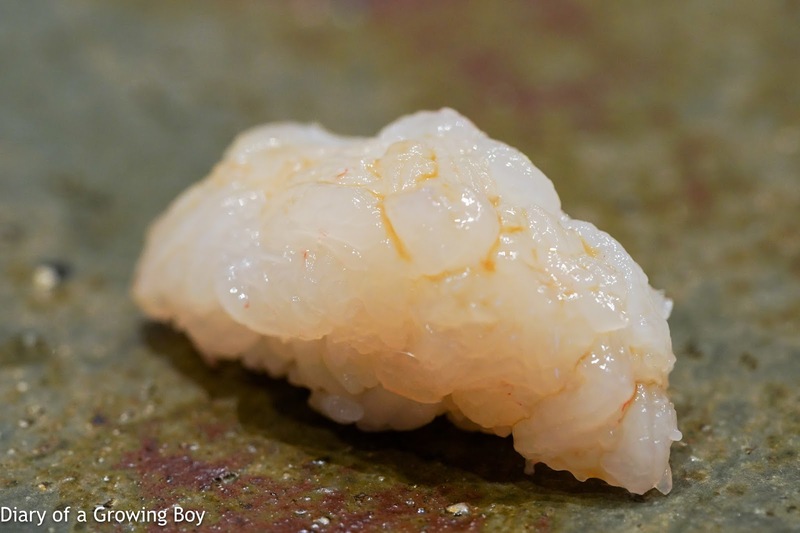 Japanese glass shrimp (白海老) - this was my substitute while everyone else got fatty tuna (大トロ). 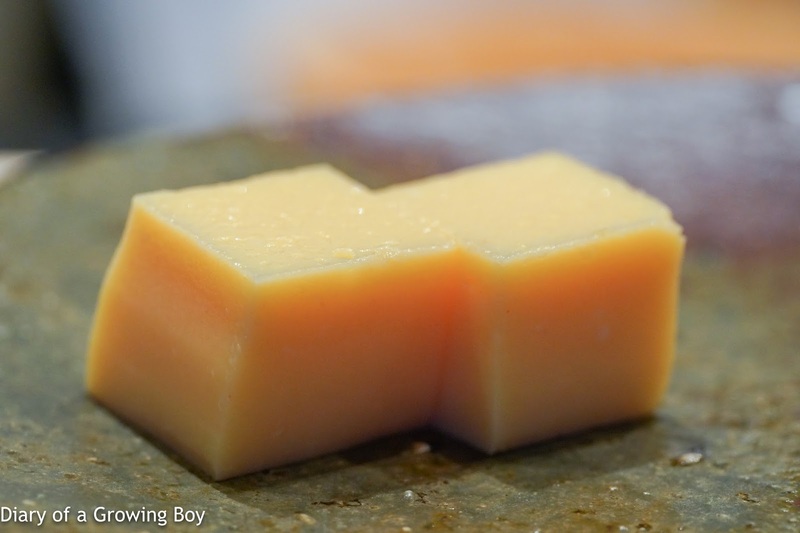 The aging made the texture soft and veered a little towards mushiness. Squid (墨烏賊) - this delivered quite a nice surprise last week, and this particular piece was still excellent. I just love the fact that the thick piece of squid was crunchy at the bottom and tender on top... thanks to the scoring and aging. With a few drops of sudachi. 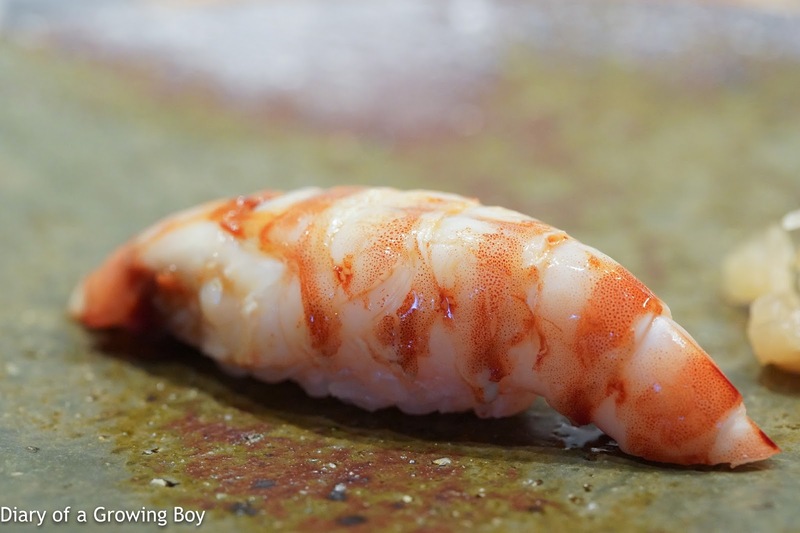 Japanese tiger prawn (車海老) - I watched as the assistant brought out a whole plate of these and began removing the shells while steam was still rising. This was still a little warm when served. Very sweet. Very tender but still has enough bite. Wasabi was certainly noticeable here. 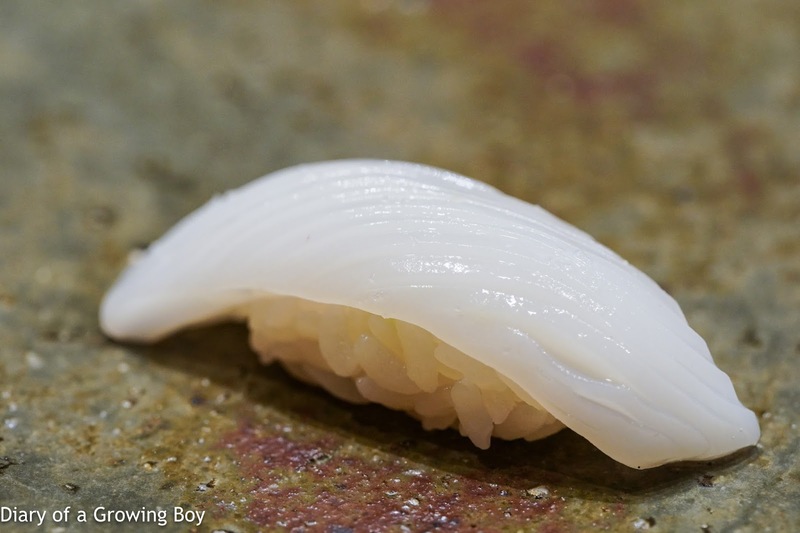 Clam shell (蛤) - tare (たれ) was very sweet, as expected, but the wasabi threw me a little. Once again the texture was wonderfully chewy, but at times I wondered if it was too chewy... and whether someone older would have difficulty cutting the clam into smaller pieces with their teeth. The other problem for me - which was a little worse than my experience last week - was that the shari began disintegrating as I tried to lift the piece with my fingers. I quickly put it down and used my chopsticks instead. Must make a mental note in the future to always use chopsticks for this. 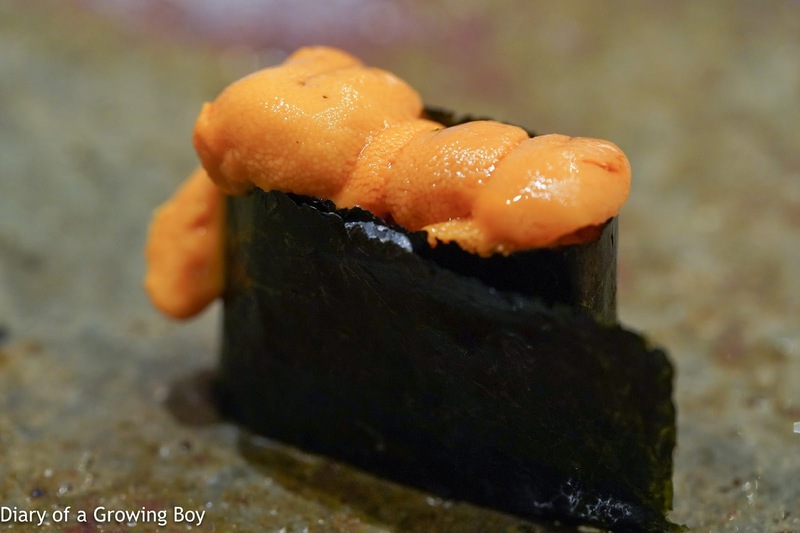 Japanese green sea urchin (馬糞雲丹) - a nice consolation prize for the missing purple sea urchin (紫雲丹). Mrs. Birdiegolf didn't care for the temperature of the sea urchin, which was icy and cold as it had just come from the chiller. But I actually found it pretty refreshing, and loved the liquefied, creamy texture. The soup arrived, and Mrs. Birdiegolf jokingly encouraged me to take a picture of it, since no one was here today to belittle me. Ya know what? I'm not taking a picture of it. Nope. Not gonna do it. Hmmph! 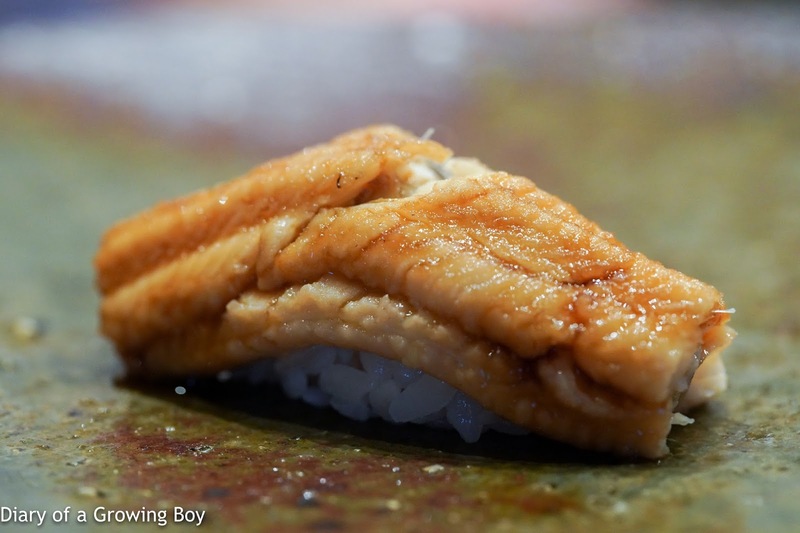 I was a little puzzled next when I saw Koba-san making a roll that didn't seem like an individual handroll... as the nori (海苔) was much too big. I got even more puzzled when he started putting marinated kanpyo (干瓢) on it, because... surely he couldn't be serving us kanpyo roll (干瓢巻き)?! 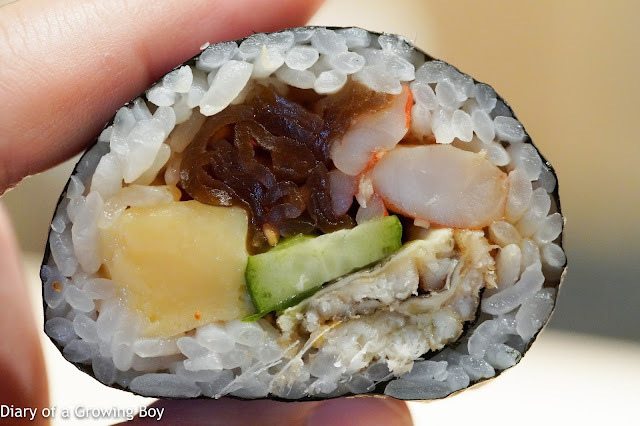 Futomaki (太巻) - thankfully this turned out to be a little more interesting... with conger eel, tiger prawns, egg custard, and cucumber in addition to the marinated calabash. Egg (玉子焼き) - not sure whether it's because they saw I had difficulty picking up the very fluffy and slippery egg custard last week, but today Koba-san decided to cut it into two smaller pieces. This way each piece became easier to pick up with my fingers. Yum. But as a result I didn't get to play with my food... Pout. It seems they've still got a few minor kinks here and there, but this was another happy meal for me. More importantly Mrs. Birdiegolf was happy - after the first two pieces of nigiri (握り). She will, of course, want to return with Mr. Birdiegolf at the earliest available date... while I wait for my first dinner experience next week.